Sequoia Nagamatsu is the author of the Japanese folklore-inspired story collection, Where We Go When All We Are Is Gone (Black Lawrence Press). His work has recently appeared in Conjunctions, Fairy Tale Review, Green Mountain Review, and Bat City Review. He is the managing editor of Psychopomp Magazine and visiting professor at The College of Idaho. I like to think about the possibilities. How many ways can a story be told? How many ways can a story be read? In one model of the multiverse theory, another version of me, layered right on top of where I’m sitting, isn’t writing this essay. Perhaps in another reality, I decided not to continue my experiment with what would become the Scope of Possibility. In another model of the multiverse, someone could conceivably travel the stars far enough to reach another universe where another Earth exists, where I’m not a writer at all (or where The Scope of Possibility remains untitled and in a drawer, never to see the light of day). There are many schools of thought about how and why this plays out—God, a computer simulation that we all live in, the organized chaos of nature. Initially, this story was born from wanting to explore a civilization of architects, beings who are well acquainted with existence on a multi-universal scale. Needless to say, I might have bit off more than I could chew, and the first draft was an MFA workshop mess. With the above premise, I found it difficult to find an anchor readers could identify with. Such beings would be too foreign, too powerful to capture emotions and relationships. The first draft took place primarily on the World-builder planet and there was really no reason for these beings to evoke empathy or be accessible to a human readership at all. Why was this story being told? Why should human readers care? So, I thought about a civilization that was just as caught up with the larger mysteries as we are but who exist to bring life to a galaxy. A civilization on the cusp of intergalactic space, old enough and remote enough to be undisturbed and whose own existence raised questions: Why do we have this capability? Are there others like us? Why are we compelled to create life? What gives us the right to create life? Perhaps in another reality, the world-builders in my story wouldn’t be so benevolent and responsible with their power. This story found its inspiration from many places but all of them play with ideas of directed panspermia (seeding of planets by civilizations) and parallel realities. Notably, I’ll mention Star Trek: The Next Generation, which I grew up with, the work of Arthur C. Clarke, and Carl Sagan. In TNG, the crew of the Enterprise encounters a being known as The Traveler who is evolved enough to see and wield the connections between time and space and thought, allowing him to travel the universe (“Where No One Has Gone Before”). In another episode, the crew along with the crews of several other species, come face to face with a holographic recording of a being who claims to have seeded the galaxy, accounting for the physical similarities between various races in the world of Star Trek—Klingon, Romulan, Humans, the Cardassians (“The Chase”). In 2001: A Space Odyssey, the monoliths lend support to the idea of intelligent intervention in our evolution. And through shows like Cosmos, Carl Sagan directly shared his belief that perhaps we have our origin on Mars by way of meteorites or by more deliberate means from points beyond. But many of the stories involving panspermia don’t focus on the life of what it’s like to be a world-builder. And that’s the story I was most interested in. In Star Trek, we get a relic and a recording. In 2001, we get a star child. In Riddley Scott’s Prometheus, we get the horror that results from trying to find our creators. But I wanted to imagine the process of creation, the relationships of a family in such a civilization, and I wondered, given the power of time and space, could a being resist the temptation to live among their creations? To intervene? These questions certainly aren’t new in the context of spirituality and religion but what about for a mother? For an immortal being who, because of a sense of duty, left her family. What would time and memory look like for this mother as she masqueraded as a human? How would she spend her time? The Scope of Possibility is a fractured journal, an oral history, a love letter, a confession of such a being who has spent time enough on Earth and as a human to tell the story as we would understand it. In structuring The Scope of Possibility, I knew I wanted to have one foot on the World Builder planet and one foot on Earth, spanning millions of years. The World-builders live in one reality but are made(as is their planet) of glowing possibility. They can see the likelihood of events playing out in our universe and those events that would have to play out in others with their Probability Scopes. This was never ever going to be a linear “he said/she said” story. I brainstormed which events and figures in history/legend I wanted to include—the Cambrian era, Atlantis, Babylon, Galileo, Issac Newton, the American Civil War and wrote these sections in no particular order, seeing them as beads to be threaded alongside the narrator’s memories of her home-world. Storytelling (and not just high fantasy) is an act of world-building and world management. The DNA of a story is just as fragile and prone to damage as a biological being or an ecosystem. And while there’s a lot we can control and plan for, I think some of the best writing (and the most beautiful things on our planet) come from accidents, mutations, and unlikely couplings. The narrator in my story is driven by the hope that one day she will be reunited with her daughter. All she has is a piece of her planet around her neck that will glow when her daughter’s necklace is near. Here is a being who comes from a civilization that designs seeds that are injected into infant planets, but even these beings don’t pretend to know what will happen; they deal in probabilities. This mother does not know when or where or even what her daughter will look like. But she is driven by this one thing that has provided purpose and direction for Millenia despite whatever detours she has chosen to take or been forced to take. I wonder where we would be without detours. I wonder where this story and many other stories would be had they remained on a particular path instead of exploring or stumbling upon the possibilities. 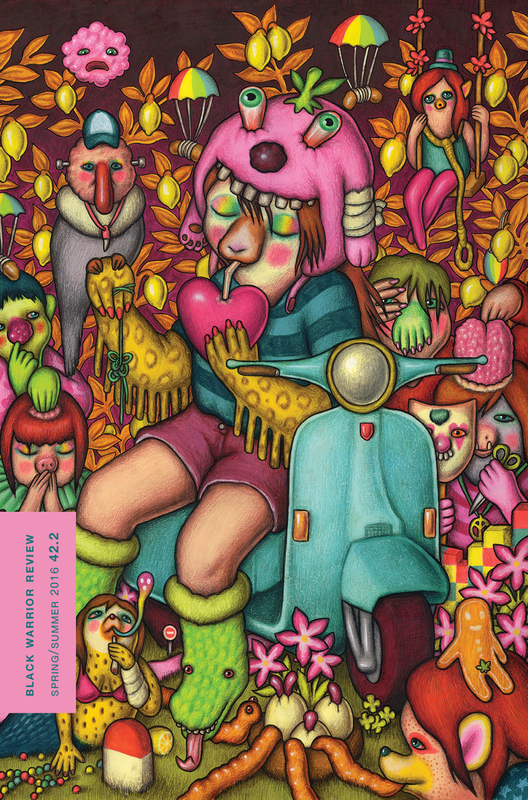 To read Sequoia Nagamatsu’s work and more, pick up a copy of 42.2 or order a subscription from our online store.